The Scarlet Macaw has been the best known South American parrot for over 100 years! The Scarlet Macaw Ara macao is one of the most magnificent of the Macaw species. This large Macaw has a long history as a companion to humans, dating back to the early 1100's with the Incas. They are described as magnificent, beautiful, and striking, as well as gaudy by some. Early authors like P. Slud, in his work "The Birds of Costa Rica: Distribution and Ecology" (1964), remarks that when feeding in the treetops, they adorn the foliage like gigantic, gaudy flowers. Wetmore, in "A Collection of Birds from Guatacaste, Costa Rico" (1944), described them as glowing with color in the morning sun. A brilliantly adorned parrot, the Scarlet Macaw is truly a fantastic spectacle of color. It is a large Macaw and very similar in appearance to the Green-winged Macaw Ara chloroptera. Both of these parrots having a large amount of red in their feathering. The Scarlet Macaw is distinguished by the broad band of yellow feathers running across the middle of its wings, rather than the green band as seen on the Green Wing. Like the Green-winged, most of its body, head, and upper wings are a bright red, but it is noticeably a lighter shadeof red than that on the Green Wing. It is also slightly smaller than the Green-winged, and a bit more boisterous in personality. A variety of common names, descriptive of their coloring, have been used for both of these Macaw parrots. Names for the Ara macao included Red Macaw, Red and Gold Macaw, Red and Yellow Macaw, Red Yellow Blue Macaw, and Scarlet Macaw. The Ara chloroptera has been described by a range of names from Green-winged Macaw, Green Wing Macaw, Red and Green Macaw, Red and Blue Macaw, Crimson Macaw, and Maroon Macaw. It was in 1949, when a Dr. Osmond Hill, after careful researched of all available materials on these species, suggested that everything be simplified. He suggested that Ara macao simply be called the "Scarlet Macaw", and Ara chloroptera simply be called the "Green-winged Macaw". These are the two common names primarily used for each of these Macaw species today. In the last couple of decades there have been new developments in the taxonomy of the Scarlet. Geographic variations of this species show slight discrepancies in size and color and suggests three possible subspecies. Common names for these variants include the Yellow-winged Macaw, Honduran Scarlet Macaw, and Bolivian Scarlet Macaw. These variants are described in more detail below. The Scarlet Macaw is very beautiful, inquisitive, and intelligent. Scarlet Macaw's are eager learners and can be taught a variety of tricks. They can be quite talented as a talker, though generally not quite as adept as the Blue and Gold Macaw. Scarlet's can learn about 5 to 10 words or phrases while the Blue and Gold can learn around 15 to 20. Like all Macaws, it has a loud call and it may be quite vocal at times. This is a lively bird that loves to play and interact. It can also be quite flamboyant and boisterous in personality. The personality of a Scarlet is such that it requires good socialization at a young age. It requires a firm consistent hand in training, especially as it matures. The well socialized Scarlet Macaw is extremely social, and will be very friendly and confident with a number people. However, this Macaw takes a dedicated and determined keeper to reach and maintain its potential as a great pet bird. The Scarlet Macaw Ara macao has traditionally been recognized as a monotypic species, but in just the last two decades experts began looking at the possibility of three geographic variations of Scarlet Macaws. In 1994 David A. Wiedenfeld suggested the species should be split in two subspecies, A. macao macao and A. macao cyanoptera. These two differ slightly in wing feather coloration and body size. It was suggested by Abramson and Thomsen (1995) that there are probably three subspecies. However designating them as subspecies has not been fully accepted. Inigo-Elias and Eduardo E., in their report "Scarlet Macaw (Ara macao), 2010", remark that this is because the observations are based on captive bred specimens, without reference to the individual Macaw's natural distribution, morphometrics or genetics. Experts say there are a number of questions and concerns when dealing with captive bred specimens. Some of these include unknowns about the origin of purchased birds due to smuggling across regions and countries prior to the birds being presented for sale. Also the decades long history of captive breeding with the accepted practice of mutation breeding for color and size, as well as the possibility of hybridization, cause further speculation. Distribution The Scarlet Macaw Ara macao was first described by Linnaeus in 1758.It originates from a very extensive range, its natural habitat runs from southern Mexico, the the state of Oazaca, south through eastern Panama in Central America; across northern South America in Ecuador, Columbia, and Venezuela; then further south in Peru, east of the Andes in Bolivia, Brazil and Paraguay; and the northeast in Guyana, Suriname, French Guiana, and the Islands of Trinidad and Tobago. Although their range is extensive, they are now reduced or devoid in many areas. Usually grouped colonies are found in areas that are more remote and less disturbed. It is extinct in El Salvador, yet has been introduced into Puerto Rico. Today there is a large group of around 100 Scarlet Macaws established south of Belize. These are believed to have resulted from escaped captive birds. Scarlet Macaws form strong bonds and are seen in pairs and family groups, as well as small flocks of about 30 individuals. They are found in a wide variety of environments across their vast range, though primarily in lowlands and along the lower foothills of interior regions rather than in coastal zones. They inhabit humid forests, particularly along waterways, arid scrub forests, tropical rainforests, savannahs, and open woodlands. They feed in the treetops, but will also frequently forage in open areas and cultivated land. They eat seed, fruits, nuts, berries, and green vegetation. This population is found from the state of Oazaca in Mexico through Belize, Guatemala, El Salvador, Honduras, to central Nicaragua. This is the more commonly seen Scarlet Macaw. It is a larger variety and its red coloration is a bright red. It has a wide band of yellow across the middle of the wings with no green to the tips. This population is found from Panama to South America. Ecuador in northern South America, and east of the Andes, from Colombia to Bolivia, and eastward across Brazil and Guyana, and on the Island of Trinidad. This Scarlet Macaw has a larger body than the Central American variant. Its red coloration is darker, and it has a narrower band of yellow feathers across the wings that are tipped in green. This population is found only in Central America; southern Nicaragua and northern Costa Rico. Inigo-Elias and Eduardo E. (2010) suggest this should be "considered a population in a zone of intergradation between the two races. Further phylogenetic studies on the degree of the genetic divergence and habitat differences on proposed subspecies are needed". Status The Scarlet Macaw Ara macao is on the IUCN Red List for Endangered Species as Least Concern (LC). The Scarlet Macaw is a very beautiful and colorful large parrot. Its general color is mostly a bright red, but it looks like a rainbow as the red becomes a band of yellow across the wings, then becoming green and blue. It has very long tapering red tail feathers tipped lightly in a pale blue and its legs are dark gray. It has a creamy white bare facial patch lined with inconspicuous red feathers. The iris of the eye is yellow. The upper beak is horn colored with a dark gray on the lower sides, and the lower beak is also a dark gray. Scarlet Macaws are a full sized Macaws. They have an average length up to about 33 1/2" (85 cm), a weight of up to about 2.2 pounds (1 kg), and a lifespan of up to 60 years. A younger bird, like the one seen in the photo at the top, will be similar to the adult in color, but with a shorter tail and a brown iris. Toga, seen in the picture to the left, is a beautiful full sized adult Scarlet Macaw. He is about 4 years old in this photo. He is seen just in front of his good friend and companion "Banjo", a Green-winged Macaw to the back. Both he and Banjo have been surgically sexed as males. The Scarlet Macaw differs in appearance from the similar Green-winged Macaw by the broad band of yellow feathers across its back. The Greenwing will have green feathers across the back. Another difference in appearance between these two Macaws can be seen in the facial patch. There are red tinged feathers on the bare facial patch of the Greenwing while the Scarlet's facial patch has almost no color..
Care and FeedingIn the wild the Scarlet Macaw eats a variety of seeds, nuts, fruits, and vegetation in the treetops. There are name brand commercially prepared seed or pellet mixes for the Macaw. They can also eat anything nutritious that you eat and these foods should be offered. Most parrots enjoy eating with their family. They eat some protein in the wild and they do like chicken. Avocado and chocolate are toxic to parrots..
See Macaw Care and Feeding for more information. HousingLarge Macaws require a roomy cage, at least 2 1/2 by 3 feet. The Scarlet Macaw can be quite vocal, be sure the cage is in a room where the amount of noise the neighbors hear is a minimal as possible. A large sturdy perch needs to be mounted in the cage. Fresh fruit tree branches work great because they can chew on them as well, but then they will have to be replaced occasionally. Food and water dishes, along with a treat dish work best mounted above the perch at the side of the cage. A variety of toys for playing and chewing should also be provided. As alternatives to a cage, they can be kept in an outdoor aviary where the weather permits, and some people like to provide their bird with its own "bird room". A large Macaws needs 2 - 3 hours a day outside their cage. The Macaw's cage is their territory and a play pen top is great, but it is still their territory. It is better to interact with a Macaw on top of a sturdy perch away from the cage. A separate, free-standing playpen works great for this. Many birds can spend most of their time on a playpen or parrot perch. .
See Macaw Housing or more information. Maintenance The basic cage care includes daily cleaning of the water and food dishes. Weekly you should wash all the perches and dirty toys, and the floor should be washed about every other week. A total hosing down and disinfecting of an aviary should be done yearly, replacing anything that needs to be freshened, such as old dishes, toys and perches. Social Behaviors In the wild Scarlet Macaws form strong bonds and are usually seen in pairs or family groups, and often in flocks or 30 or more birds. In general this is a typical Macaw. Macaws can be quite loud, being especially loud when anticipating interaction with you. They will also mirror your moods, so if you are agitated, they can become agitated. If you are happy and loving, well so is your pet. However these Macaws are quite lively and boisterous, more so than many of the other types of Macaws. They can be cranky at times and may even be a one person bird or only like men or women unless well socialized with lots of folks. They need a keeper that provides a firm hand in training. For a wonderful pet, the Scarlet Macaw must be socialized at a young age, and then have continued contact and interaction on a daily basis. Scarlet's take a good deal of time to maintained good socialization. If not maintained, they can become aggressive and loose their tameness as they mature. Those birds are then never completely trustworthy, and are best paired up for breeding. Handling/Training The Scarlet Macaw is intelligent and eager for attention and play. This Macaw adapts quickly and once it becomes accustomed to a new environment and its keeper it is then ready to start bird training. Generally though, you should give a new arrival a few days to get use to you, your voice and its cage before trying to handle it. A hand fed baby will not need much taming and can often be handled right away, as it is use to human attention. With all parrots, taming and training takes trust and patience. The Scarlet Macaw is quite intelligent and responds well to consistent yet firm handling. They are very adept at learning and quick to train. They excel best at learning tricks and small tasks. They are not as inclined to talk and mimic as some of the other parrots, notably the Amazon Parrots, but they can learn a few words or phrases. ActivitiesFor the physical well being and psychological health of a Macaw Parrot, they must have plenty of opportunity to exercise and play. Providing regular interaction and lots of playtime. Having plenty of space and a large selection of toys and activities will help deter distress in your pet Macaw. These are lovable pets and activities include interactive time with its keeper. Everything from petting, cuddling, and preening is appreciated, as well as performing and learning new tricks. But these are also very large, rambunctious pets that need a good sized space to play and climb around. Both climbing around inside a large cage, and providing a outside playpen offers them interest and variety. Macaws are avid chewers, munching intently on anything they can get a hold of. When they are on a playpen, make sure they can't reach trim or any household items you don't want destroyed. Provide lots of toys and activities in the form of large link chains, bird ladders, parrot swings, ropes, and wood toys for gnawing and chewing. Rotate in new bird toys on a regular basis. Sexing - Sexual DifferencesNo visible differences. There is no for certain way to distinguish a male Scarlet Macaw from a female. In order to know whether you have a male or female, the bird must be sexed. DNA / Feather or surgical sexing is recommended. Breeding/Reproduction The Scarlet Macaw is well established in aviculture, especially in the United States and Central America, and is commonly bred in captivity. The usual clutch consists of two or three eggs which incubate for about 28 days. The babies will fledge after about 3 months in the nest. Feed the parents additional high-fat seeds, like sunflower seed, during the breeding season. Also feed the parents plenty of green stuffs, corn-on-the-cob, carrots, protein, and fruit laced with food supplement while they are rearing the youngsters. The Scarlet Macaw has also been crossed with other large macaw species to develop a number of hybrid Macaws. 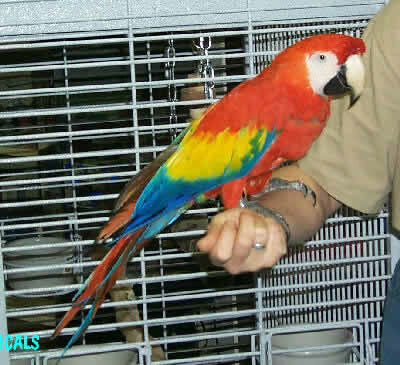 These include first generation (F1) hybrids like the Catalina Macaw, Ruby Macaw, Shamrock Macaw, Verde Macaw, and the Hyacinth Macaw x Scarlet Macaw, and second generation (F2) and later generations hybirds such as the Camelot Macaw, Scarlet Macaw x Shamrock Macaw, Starlight Macaw, Tropicana Macaw, and Capri Macaw, and the Scarlet Macaw X (Catalina X Military). It has not been hybridized with Mini Macaws. Potential Problems It is definitely true that a Macaw parrot can make noise, but it is not often, and not without some provocation. Usually, if they make a loud squawking noise if they perceive something to be wrong or different. Maybe a car they don't recognize is coming to the home or the dog is loose. They are also known to make a large noise for about 10 minutes as the sun is setting. This is an alert to their flock to settle in for the evening. If you notice any of these bird illnesses in your Scarlet Macaw immediately provide a warm, draft free, secure environment kept at about 86°F (30°C). Place food and water close to the perch where it is easily accessible. An ailing parrot should be taken to an avian veterinarian for diagnosis and treatment. Availability: The Scarlet Macaw is rarer than some of the other Macaws for sale (except perhaps the hybrid Macaws) and may be a bit harder to get. Their natural habitat has declined to the point where they have been put on the endangered species list, so its best to acquire captive bred birds. Experienced macaw owner wants Scarlet, Blue and Gold or Hyacinth.